An evergreen perennial that forms a cushion of dark green needle-like leaves. 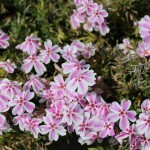 The spring flowers are bright pink with white edges. It prefers full sun and well-drained soil. It is drought tolerant once established. Useful in a rock garden, edging a shrub border, or cascading over a rock wall.